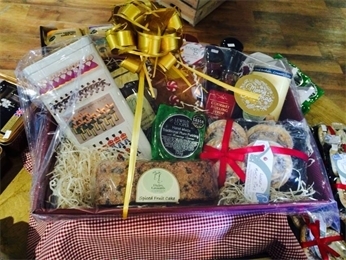 Beautiful food hampers created using carefully selected Artisan products including foods, wines and spirits. Lizzy's hampers are available all year round as gifts, especially Christmas. They make for great corporate gifts, or unique presents for food lovers on birthdays and other special occasions. Hamper prices are the total price of the products chosen, along with a small charge for packaging. (varies depending on hamper size.) Most customers choose their own hamper contents making the perfect bespoke gift. However, if you would prefer, we will do all the work for you. Just give us a brief description about who the hamper is for and a brief idea of their favourites and we will get creative on your behalf. Currently, we are unable to ship hampers by post but as an alternative we may be able to offer local delivery at a small charge. email Lizzy at: shop@onleygroundsfarmshop.co.uk for more info. For the home, we have a beautiful selection of hand decorated and locally made tiles decorated with artwork of birds and animals made by a local lady from Winton Willow platters. Our wine selection from around the world, sloe motion gins in a variety of flavours, along with Chase vodka and gins make for fantastic gifts and can be presented in hampers or bespoke packaging. We have now extended our range of giftware to include kitchen related items such as tea towels, aprons, hob covers and more from the beautiful Sophie Allport range. If your looking for a lovely gift for the kids or even yourself, our gorgeous new range of living nature soft toys are so realistic that you may not be able to tell the difference! !